A master marksman wants your equipment to be up to scratch before she will train you. Marksman skill of 70, Level 9 to obtain Elven Bow. Once you have a Marksman skill of 70, speak with Pinarus Inventius or Reman Broder. Find and bring back an elven bow for Alawen in order to train. The two advanced trainers who can give you the master training reference necessary to start this quest are Pinarus Inventius in Anvil and Reman Broder in Skingrad. Speak with Alawen at Troll Candle Camp to find that she requires you to possess an elven bow before she will train you. Only an unenchanted elven bow will do, even though glass, ebony, and Daedric are better quality. Alawen will not take the bow, she just wants to make sure you're using "good equipment", which is quite ironic, considering she herself uses a silver bow. 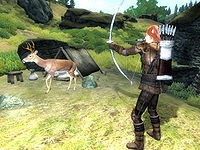 Elven bows may be found on Bandit bowmen, Marauder archers and Skeletons at level 9. They can also be found randomly in the Legion Commanders Chest in the Imperial Legion Offices between levels 9 and 11. Goblin Warlords may also carry elven bows (25% chance). At level 13, elven bows may be available from vendors. This is the only quest in the entire game other than the Daedric quests that has a "level requirement", though it is not exactly the level that is required, as Elven bows are not available in-game anywhere before level 9. While it is possible to "complete" the quest by failing it, if Alawen should die after the quest has been obtained, it is impossible to receive her training without reaching the required level. Alawen's hunting often takes her too close to the unmarked Red Lane Camp west of Dasek Moor, where she can meet an unintended death. Like Torbern, Bralsa Andaren, and Tooth-in-the-Sea, if Alawen dies before beginning her Master Training quest, the quest can be obtained but not completed, and will stay active. 10 I need to find Alawen, so that I may master my use of a bow. 20 Alawen has agreed to teach me, but only if I acquire a normal Elven bow and bring it to her. 100 Finishes quest I have met Alawen's requirements, and she has agreed to teach me what she knows. 200 Finishes quest Alawen is dead. I have no hope of being taught more about Marksman skills now. It is possible to use the console to advance through the quest by entering setstage TrainingMarksman stage, where stage is the number of the stage you wish to complete. It is not possible to un-complete (i.e. go back) quest stages. See SetStage for more information.